Beauty seeps through every single moment on Layers of Us. The Portland trio’s latest, led by Nate Lacy, further expands upon their decorous prog-folk by taking a more urgent effort to claim responsibility for how we live. It’s an ambitious undertaking, but Lacy handles these theoretical concerns with his usual naturalistic style. In fact, it’s perfectly sound to enjoy Layers of Us as a wholly sensorial experience. The psychedelic-leaning Sunlight Daze brushes every painterly texture with a gentle touch, enveloping its brittle tapestry of sounds as they float over a shuffling drum rhythm. Never do they opt to take a life-size approach, as they create an intimate, headphone-rich experience that pulses with a freewheeling energy. So it’s no surprise that Mimicking Birds excel when the wistful atmosphere they create takes a wandering course into semi-jam territory: lucid album closer One-Eyed Jack retains a locked groove undulating below arpeggiated guitar chords as Lacy mutters his words with quiet deliberation, while the superb Lumens shares a familiarity to their earlier work by emphasizing space with an airy, minimal composition. But Mimicking Birds do make an effort to change their usual template, albeit, with varying results. Island Shore is trickled with mechanical synth sounds, and it does bode well with its continuous beat until they abruptly change the song’s pitch with awkward breakbeat poetry. Even the twangy A Part takes a different guise from their usual drift, given how they quicken the song’s pace with an intriguing tension. It’s still something of a challenge to decipher Lacy’s cryptic introspection, but at least Belongings resonates with wholesome clarity, a thoughtful meditation on how we’re all connected to some larger being even when he focuses on the fineness of a loving bond. 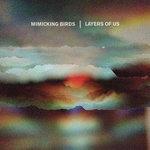 It perfectly summarizes Mimicking Birds’ open-ended purpose, a gliding journey that attains an otherworldly allure even when it’s grounded in reality.